The concept of ‘time’ is fundamental to how we understand the world. I’m not talking so much about clock time, as basic ideas like ‘before’ and ‘after’, ‘past’, ‘future’, and ‘now’. Because time is not something we can see, hear or touch, we have to resort to metaphor in order to talk or think meaningfully about it. The most widely used metaphor, so common that we hardly notice it when we use it, is to talk about time in terms of distance. “Winter is coming”, “The New Year is nearly upon us”. In either case, we talk about time in terms of distance. We say “Further on down the road”, “a long time ago”, “the near future” and so on. In industrial and post-industrial cultures we are still more familiar with time as being a line – think of any graph that has time as an axis. When they think about it, some people imagine the future ahead of them and the past behind them, with now being where they are, so they are embedded in their timeline. As a generalisation, these people are more ‘in the moment’, more engaged in whatever they are doing at the time, and consequently often are not great at managing their time. Often, they turn up late for meetings because they get so involved in whatever they are doing that they don’t see the next item in their diary until it’s right on top of them. 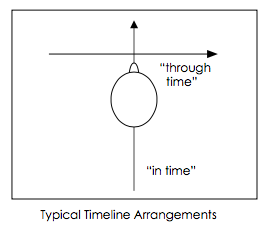 In NLP terminology this configuration is often called ‘in time’ because the person is embedded ‘in’ their timeline. For other people, the past is to one side (usually the left) and the future to the other (usually on the right) while ‘now’ is just in front of them, so they can see the whole of their timeline from left to right in front of them. Because they can see the past and the future laid out in front of them, they tend to be good at time management and will often show up early for appointments (these are also the people who get annoyed if you show up even a minute or two late). This configuration is often called ‘through time’ because the person is ‘looking through’ their timeline. And there are many variations, with no ‘right’ or ‘wrong’ way to have your timeline. Some people switch between the two timelines, or can even have both running simultaneously. An interesting property of the timeline is that for most people, if you imagine floating up above it, you start to feel more detached, calmer, and more peaceful. Some people who are reluctant to even think about their past because of uncomfortable memories find that floating up above their timeline enables them to look towards that direction quite easily. So what’s the relevance of the timeline to learning, reviewing and recalling knowledge and skills? Each of our memories, each past event we recall, has its own particular place in the timeline. In fact, our unconscious minds make sense of a particular memory by its location in the timeline relative to other events. The ‘older’ a memory is, the further along the past timeline it will be located. So by going back to a particular point in the timeline where we felt excited, or capable, or successful, we can recapture that resourceful emotional state and bring it back to the present where it can help us to face our current challenges more successfully. By going back to the time when we learned something new, we reactivate that memory in our minds and reinforce the learning in our brain’s neural networks. Floating back above the timeline means that we can go straight to the relevant memories and breakthrough moments in our learning, while skipping over any uncomfortable memories that might lie between then and now. You can ask your unconscious mind to review the whole of your course or training programme, floating forwards from start to finish only as quickly as you review what needs to be reviewed. And there’s a lot more that you can do with timelines in terms of setting goals in the future, and clearing up any unresolved baggage from your past, as you will discover if you attend a good NLP training course. 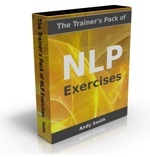 If you’re currently studying or on a training course, this guided visualization MP3 is for you! Originally developed as part of the forthcoming NLP Practitioner home study pack, it’s designed to help you review and integrate everything you’ve learned on any course or training that you’re undertaking. It takes you on a journey above your timeline to help you recover resourceful emotional states from times when you learned new knowledge rapidly and easily, and bring them back to the present. During the journey we ask your unconscious mind to review and integrate everything you’ve learned from the start of your training programme, all the way back to now.